Ok, on the face of it today may seem, to a casual observer, to have been a rather uneventful or less than productive day. I would however like to think that I have managed to make at least some headway and I should also like to point out, as Mr Bublitz over at woodworkingnoob.com did to me; that productivity does not always take the form of making things ready to ship out to a customer. 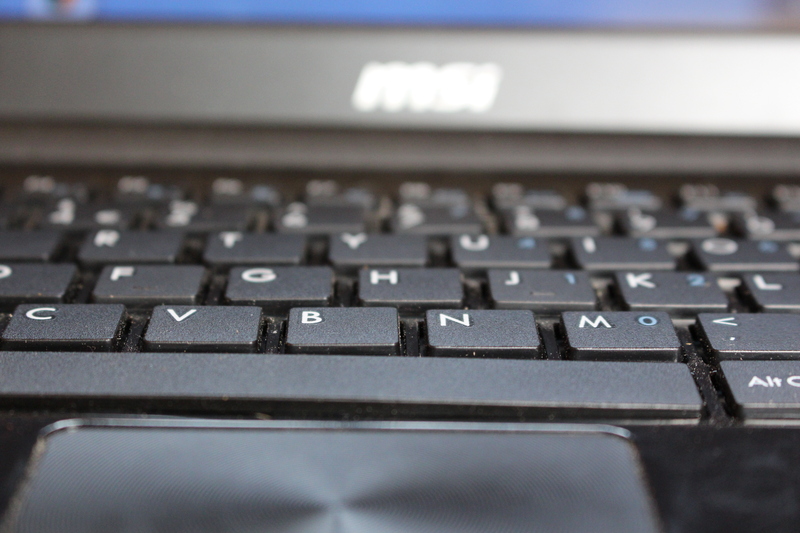 Not only am I still learning all about this blogging/website stuff, but also about other aspects, such as filming and editing for my YouTube channel. These things take up a suprising amount of time! Anyway back to the point, I've just finished filming the first two episodes of my upcoming router series, and since its all recorded currently on my mobile phone, it's eats through the battery like you couldn't imagine! - It's currently on charge, (again). The first charging session was spent cleaning all my router cutters. The episode in question is about cutters and their care, so it made sense to be productive and clean all that needed doing. Plus points for productiviy there at least. Anyway next I thought I'd blog about it (you've read this far presumably), so now for the experimental bit, and something nice to look at. your reward for staying loyal and continuing reading you see! This picture frame was a first in so much as i was wanting to experiment, (can you remember as far back as the title? ), I'd been wanting to make a replacement for a ridiculously poor quality frame that came surrounding the beautiful image that is my little V.I.P's school picture. and it seemed a good opportunity to try using polymer clay for inlay work. 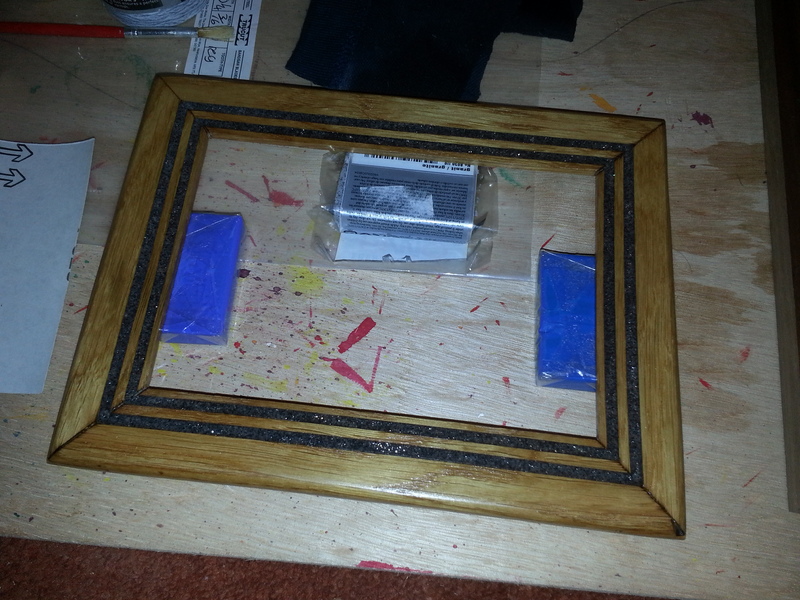 the frame is a simple Oak affair oiled, with a sparkly granite coloured clay set in. the mitres opened up during the baking, even though it was splined. TBH though I think it makes it look like quite an old and aged frame, the image speaks for itself. 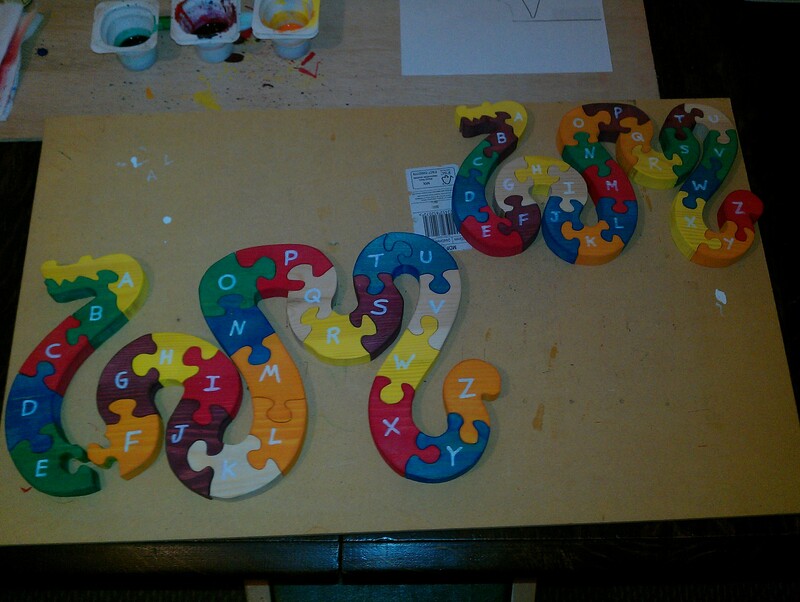 These Alphabet snakes were stained rather than painted to let the grain show through, A really nice experiment using bright colours as much as water-based stains. They turned out rather nicely, but have yet to find their owner. 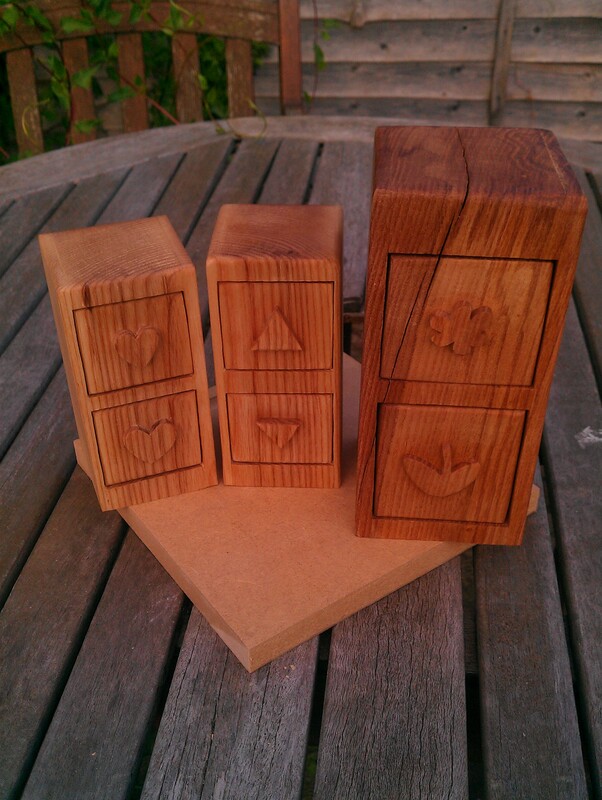 The first, 3, bandsaw boxes i ever made, all given as Christmas gifts. Being male I was ready to just cut out round drawer pulls, but my "far more creative than I" better half from Hippynoodle though it might be nice to cut hearts and the two parts of the flower instead. since they were gifts for my two nieces it seemed like a good idea! I take the credit for the middle one, as it looked like the buttons for a lift! 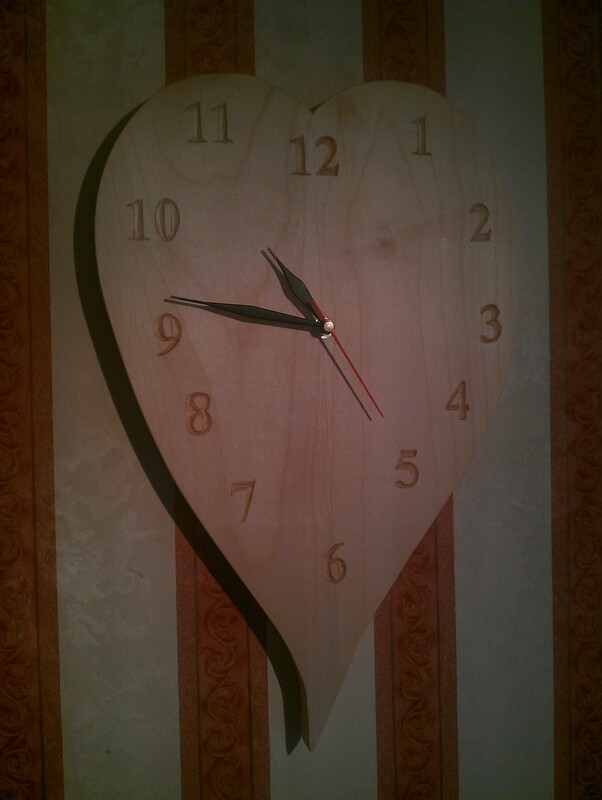 This item is not only the first clock I ever made, but also the first, (and quite possibly the last), bit of hand carving I've done. By hand carved I refer of course to hammer and chisel, rather than routing. These few things are all polymer clay firsts and experiments. 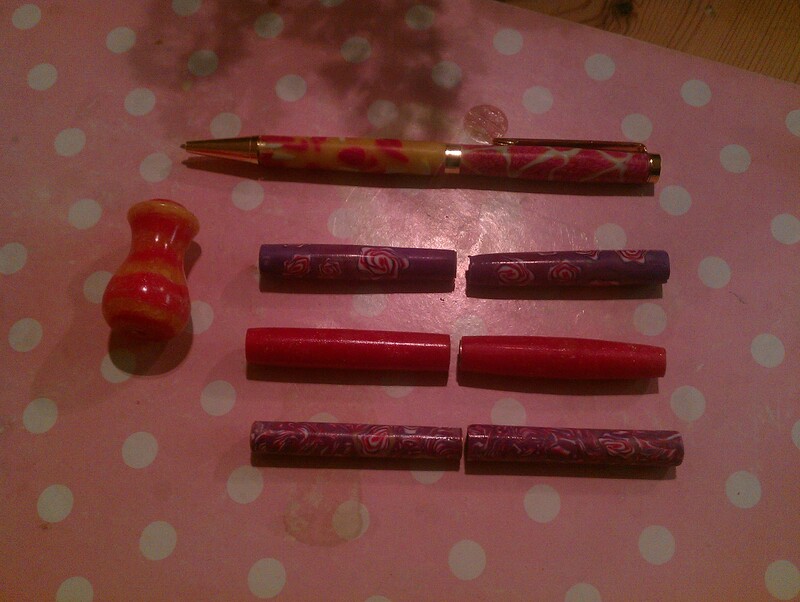 I got given a book on turning pens, which had some polymer clay pens already turned, they use the same method used making sea-side rock, to make patterns and flowers, all wrapped round the brass tubes, baked and turned. I even managed to turn a light pull from the polymer clay as well. incidentally, for anyone looking to turn polymer clay, it turns very easily, basically the same as acrylic penblanks, and is polished in the same way. 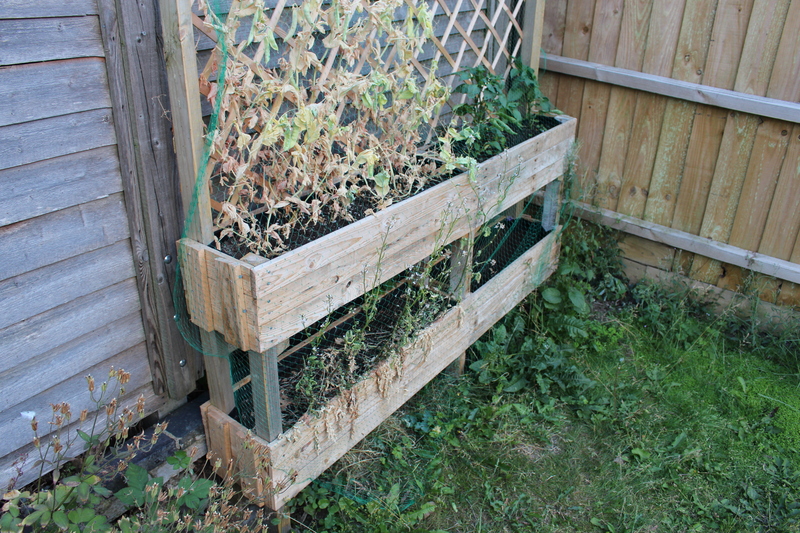 This is the first pallet project I made, for my better half's garden, at least it's doing better than the peas and lettuce, although the peppers at the back seem pretty hardy! Another arty fade to type picture just playing around with the DSLR. 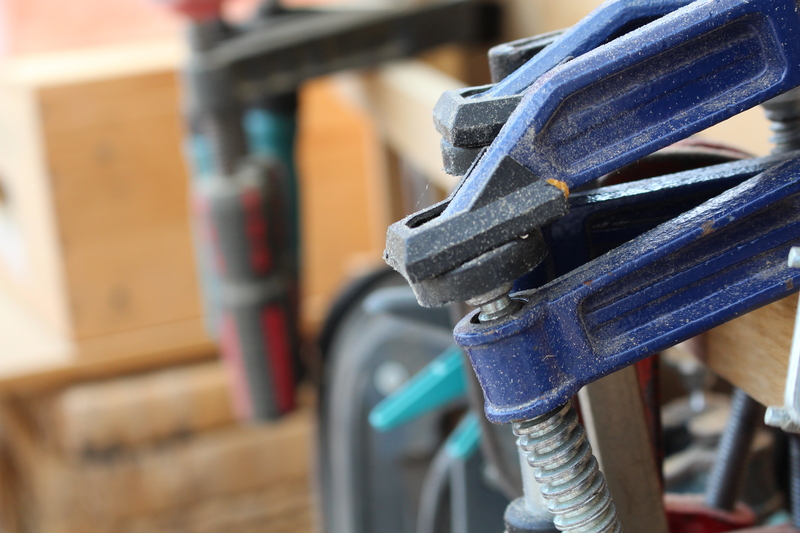 you can never have enough clamps! Ok. Back to filming, battery's probably charged now! Good article, Rick! Nice to see how you are developing your style and to see the projects you've done! I really like your picture frame and think it's the best way to frame kids school pictures. Thanks for sharing your fun firsts and experiments!